For the experienced sailor wanting the freedom to cruise at their own pace, bareboat chartering is for you. All of our UK sailing yachts are available for hire for completely independent sailing, leaving you to plan your own itinerary and to sail where and when you choose – within the Solent, along the UK South Coast, or across the Channel to France and the Channel Islands. 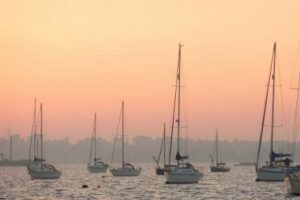 Unlike other charter companies, Hamble Point Yacht Charters offers an unrestricted sailing area, so you can explore the Solent and Isle of Wight, or venture further afield at no extra cost. To book a bareboat yacht charter from us we have to be satisfied that you will be able to safely skipper the yacht throughout your sailing holiday and return her safely to us. Our general requirement for bareboat hire is that the skipper should be experienced to a level equivalent to RYA Coastal Skipper and that at least one crew member should have experience equivalent to RYA Competent Crew. If you do not have formal sailing qualifications that meet these conditions then we will request a “sailing CV” from you listing your sailing experience and our Fleet Manager will have a chat with you to satisfy himself that you are competent to hire your choice of sailing yacht. For some of the smaller boats on our fleet (up to 36 feet), it is possible to arrange a bareboat charter from us with two persons with the equivalent of RYA Day Skipper (Tidal) on board; or on occasion, an experienced RYA Day Skipper plus an RYA Competent Crew. If you are unsure about whether you and your crew have the necessary qualifications then please call us to discuss this further. If there is any doubt then there is always the option to include a skipper in your charter for the first day. If they are happy that you are competent to continue sailing on your own after the first day then they will leave you to continue your charter on your own. If you don’t yet have the right qualifications, complete your RYA training course with us. Our superb fleet of sailing yachts are maintained to the highest standards and fully equipped with stereos, TVs in some cases, domestic equipment, as well as all essential safety and navigation equipment, charts and almanacs designed to make your cruise comfortable, enjoyable and safe. Many of our yachts have state of the art electronics as well as the basics; including colour chart plotters, AIS and radar. Please see our standard list of charter equipment for more information on what you will find on board. If you have children on board then we would be happy to discuss adding child netting to the guard rails to help keep your little ones on board! We are members of the British Marine Leisure Boating Association as well as the Professional Charter Asociation and we fully meet their standards. All our charterers have the support of Sea Start as well as our full time staff at our base and a 24-hour emergency telephone line.so if you do experience any difficulties during your charter there is comprehensive support available to you. Just book your own berth!